Lama Zopa Rinpoche teaching at Tushita Meditation Centre, Dharamsala, India, June 2013. Photo by Ven. Sarah Thresher. 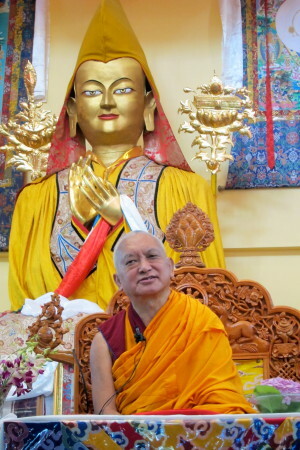 In Mandala October-December 2013, Lama Zopa Rinpoche responds to a long-time student who wrote to Rinpoche in thanks for his “blessings, guidance and protection” over many years. The anonymous student currently takes care of her mother who suffers physically after a series of strokes. As a method to deal with the challenges of caregiving, the student visualizes taking care of Rinpoche when taking care of her mother. First of all, it is really great the meditation you are doing: serving your mother and thinking you are serving the guru. When I was in Tibet (not the last time, but the time before) our journey took us to Reting, Lama Dromtönpa’s monastery, which he built on the advice of Lama Atisha. I didn’t know, but our guide directed the tour through His Holiness the Karmapa’s monastery in Tshurpu. We stayed there one day and slept outside the monastery in tents for two nights. I went to visit nearly every temple in the monastery. The monks were doing puja and I personally made money offering to each one, handing them the money myself. As I did this, I started to think that each one was my guru, His Holiness Trijang Rinpoche or Lama Yeshe (maybe the first one). This is what I was thinking as I gave the money, so I collected the most extensive merits and accumulated the most powerful purification because I was thinking of each monk as the guru.